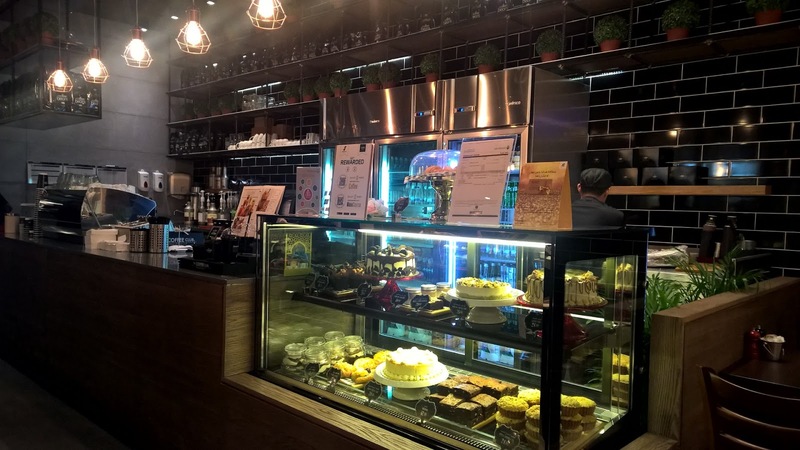 People love coffee shops here in the U.A.E. They are everywhere. I once counted ten in one mall. It means that standing out from the competition is a very tough task. My daughter and I recently tried a new addition to as Mall, The Coffee Club. 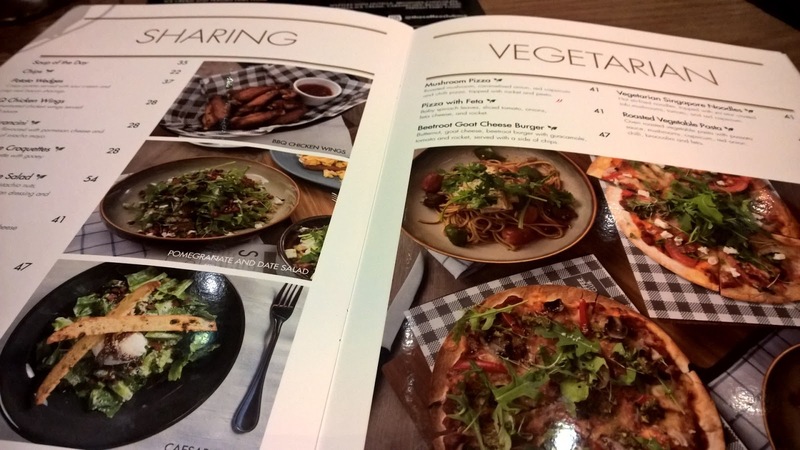 The latter, an Australian franchise, prides itself on being a place to meet people. The Coffee Club carries on the laid back tradition of the original shop that opened in Australia years ago. Staff are young and have that cool element that you associate with coffee shops. It is interesting to note that the staff here at the Yas Mall outlet is a mix of African and Eastern European. Nice. 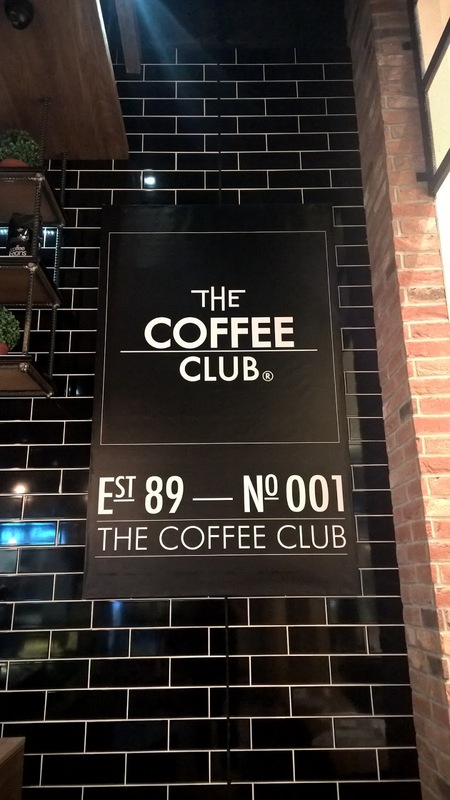 That is already one way for The Coffee Club to distinguish itself. 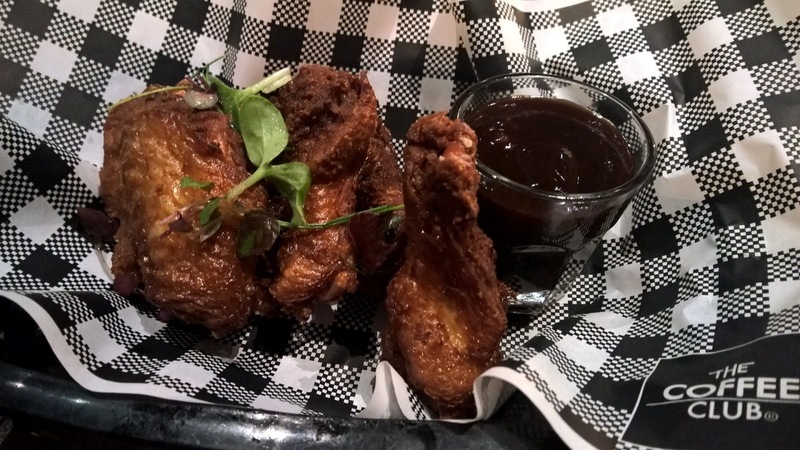 The menu is extensive and offers a wide variety of options. 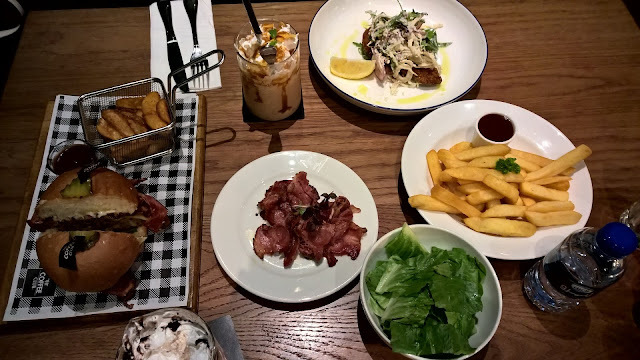 While we were going through the menu, I could not help but stare at the table next to me where I see an Angus Beef burger and veal bacon on the side served to a guest. Politely, of course, I ask for a picture. Forgive the angle. This is no ordinary coffee shop! It is indeed an all day dining restaurant. 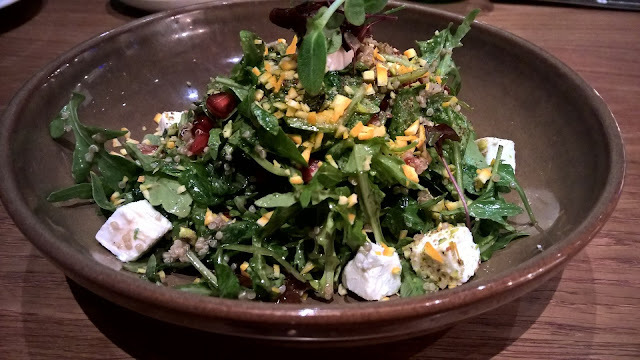 My daughter and I share a Pomegranate and Date salad with feta cheese - fresh, sweet and sour and wonderfully textured with quinoa. As we enjoy this, my daughter notices the bosa nova music. We like it. Another way that it differentiates itself from other coffee shops. Soon after, we order our main dishes. She has the BBQ chicken wings while I have the Chicken schnitzel. 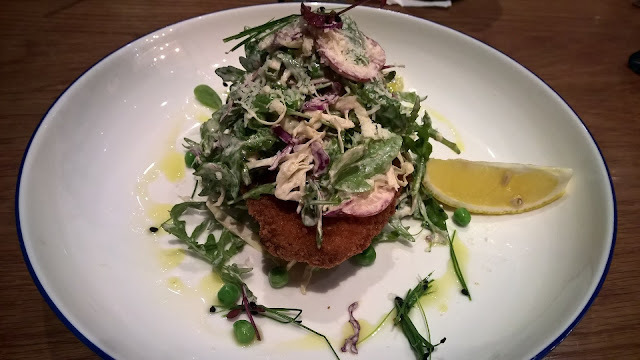 Seriously, both are as good as any casual dining restaurant I have been in, and as I finish my deliciously crispy chicken schnitzel, it dawns on me that The Coffee Club gives one the menu of a restaurant but with the service and vibe of a coffee shop. The Coffee Club is big on desserts, and while I find the Banana split uninteresting, it is the selection of shakes that interest me. 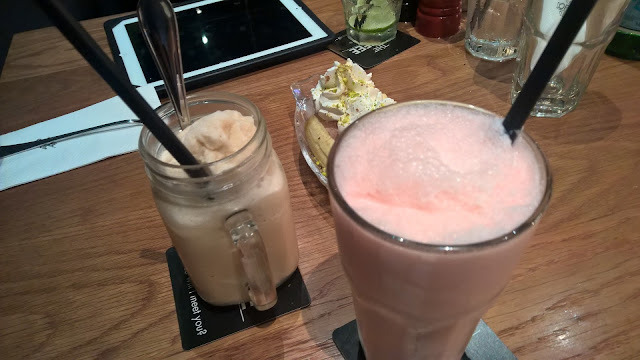 There are two - a very thin one that is child-friendly, more like flavoured milk, and a decadent one with a slice of cheesecake perched on the glass. Decadent! 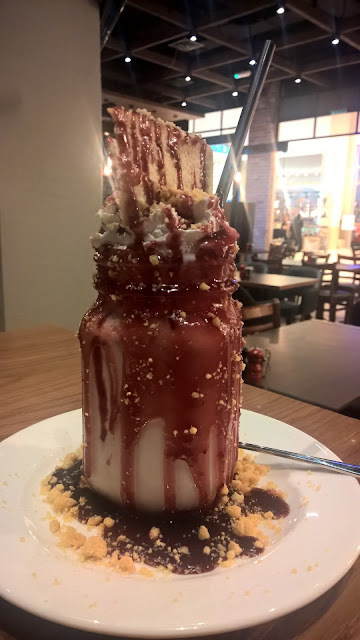 It is called a Loaded shake. Make sure you have raspberry. My daughter, meanwhile, has a Toffee Coffee frappe - fantastic. I do not care for designer coffees, but this is a frappe that actually still tastes like coffee. Highly recommended. Having said that, the coffee options are quite succinct, with none of the ubiquitous flavoured coffee drinks you find everywhere else. Finally, the coffee at the Coffee Club is UTZ certified, meaning it is all about sustainability, fair practices and care for the environment. 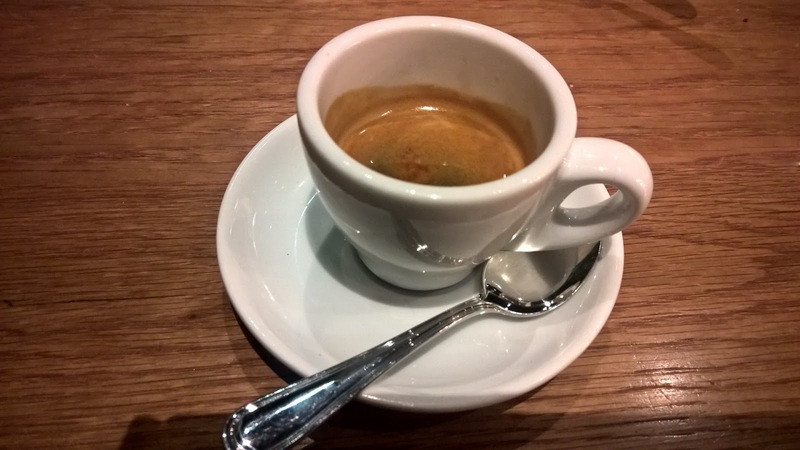 This, together with organically certified eggs, makes it a coffee shop that will certainly gather a new group of followers as people become more particular about where and what they eat and drink. Overall, The Coffee Club is more than a coffee shop that serves excellent casual dishes. Whether it is breakfast, lunch, or Arabian dishes, you will find it on the menu here. This brings home the idea of it being an all day dining outlet. If coffee is all you want, you will feel comfortable having it here because the service is that sharp coffee shop service you know, but minus the annoying up-selling that is common around other coffee shops.